Item is a letter sent to the Chronicle-Herald for Barbara Hinds by an anonymous employee of the Anil Canada Ltd. hardboard plant. 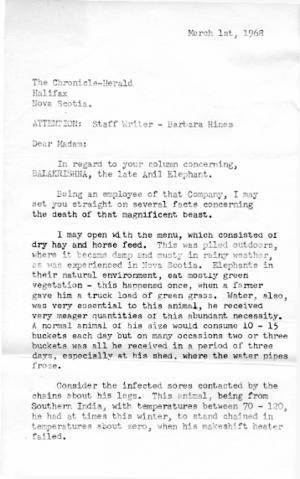 The letter details the poor living conditions of Balakrishnan, an elephant that was brought to East River, Nova Scotia by the Anil plant. The letter is accompanied by the envelope that it came in as well as two photocopies of the letter and the envelope.